This is the 177th edition of the Epileptic Gibbon podcast music show and the playlist to accompany it. CLICK HERE TO LISTEN. The show is also available via Mixcloud HERE and the Progzilla Radio Network (the show is now appearing on Progzilla in alternate weeks). This latest show is built around an interview with Michael Bearpark of Henry Fool, Darkroom & No-man, with Michael choosing most of the music and reflecting on the connections between the choices and how they have intersected with key moments in his life. There’s no feature album tonight but you can expect to hear lots of Darkroom and tracks connected with people that Michael has worked and played with, plus a typically eclectic musical mix. Below you’ll find the track list, plus weblinks from where you can find more information about each artist. Total running time: 3 hours & 21 minutes. Downloaded file is 185.6 MB. Thanks to all the musicians who contributed and to all listeners. Send us comments if you like what you hear (or even if you don’t… feedback is so important!). If you want to keep up to date with news about the show, EppyFest, or just chat with other listeners, don’t forget that there’s a Facebook group – just search for the Eppy Gibbon Podcast Show on Facebook and request to join, plus don’t forget that we’re now part of the Progzilla Radio Network. I’ll be back for the next show when I’ll be returning to my review of the music of 2015, specifically focusing on some great music from last year that didn’t feature in my top 31 countdown, so I hope you’ll join me for that. This is the 155th edition of the Epileptic Gibbon podcast music show and the playlist to accompany it. CLICK HERE TO LISTEN. The show is also available via Mixcloud here and the Progzilla Radio Network soon (the show is now appearing on Progzilla in alternate weeks). 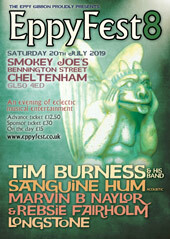 Your usual host, Eppy, is experiencing a busy period at work and is preparing for EppyFest 4, so Rebsie & Daniel from Alchymical Muse have kindly stepped in to bring you another of their takes on the Eppy Gibbon show. You can expect a typically eclectic musical mix, including a feature artist (rather than a feature album), XTC, and there will be three tracks from that band. Below you’ll find the track list, plus weblinks from where you can find more information about each artist. Total running time: 2 hours & 8 minutes. Downloaded file is 117.3 MB. Thanks to all the musicians who contributed and to all listeners. Send me comments if you like what you hear (or even if you don’t… feedback is so important!). If you want to keep up to date with news about the show, EppyFest, or just chat with other listeners, don’t forget that there’s a Facebook group – just search for the Eppy Gibbon Podcast Show on Facebook and request to join, plus don’t forget that we’re now part of the Progzilla Radio Network. Eppy will be back for the next show which will be a long track special so I hope you’ll come back for that. This is the 151st edition of the Epileptic Gibbon podcast music show and the playlist to accompany it. CLICK HERE TO LISTEN. The show is also available via Mixcloud here and the Progzilla Radio Network here. This show and the next are special in that they are a celebration of my (as I type this) upcoming 40th birthday. Across the two shows I’ll be playing 40 tracks to celebrate some of the music that has made me who I am today (but don’t let that put you off!). Tonight starts with the first 20, covering the years 1975 to 1994. We’ll cover the usual diverse selection of styles and genres, including prog rock, folk, baroque pop, trip hop, art rock, post-punk, pronk rock, industrial rock, electronica and all sorts of other weird & wonderful music. Below you’ll find the track list, plus weblinks from where you can find more information about each artist. Total running time: 1 hour & 57 minutes. Downloaded file is 106.8 MB. Thanks to all the musicians who contributed and to all listeners. Send me comments if you like what you hear (or even if you don’t… feedback is so important!). If you want to keep up to date with news about the show, EppyFest, or just chat with other listeners, don’t forget that there’s a Facebook group – just search for the Eppy Gibbon Podcast Show on Facebook and request to join, plus don’t forget that we’re now part of the Progzilla Radio Network. I’ll be back soon with the second part of my 40 at 40, featuring more of the music that’s been really important to me over the years, so I hope you’ll join me again then. This is the 141st edition of the Epileptic Gibbon podcast music show and the playlist to accompany it. CLICK HERE TO LISTEN. You can also listen via Mixcloud here. This time around Daniel & Rebsie of Alchymical Muse are sitting in for me & choosing all the music again as I focus on my day job. The feature album is ‘Clocks Are Like People’ by psych/prog folksters Circulus & there will be three tracks from it. Below you’ll find the track list, plus weblinks to where you can find more information about each artist. Total running time: 1 hour and 39 minutes. Downloaded file is 91 MB. Thanks, as always, to everyone involved with this show, musicians and listeners alike. Please leave a comment if you like what you hear (or even if you don’t… feedback is so important!) or if you want to have your say on anything else connected to this podcast. If you want to keep up to date with news about this podcast, EppyFest, or just chat with other listeners, don’t forget that there’s a Facebook group – just search for the Eppy Gibbon Podcast Show on Facebook and request to join. The next show will see Daniel & Rebsie return with more of their own unique take on the styles of music we cover, so I hope you’ll come back for those. This is the one-hundred-and-twenty-sixth edition of the Epileptic Gibbon podcast music show and the playlist to accompany it. CLICK HERE TO LISTEN. You can also listen via Mixcloud here. This show is a guest slot introduced by Rebsie Fairholm and Daniel Staniforth of Alchymical Muse. The feature album is ‘Me Oh My’ by Cate Le Bon, the 2009 debut album by this very talented artist from Wales. There’s also lots more new, old and unusual music. Below you’ll find the track list, plus weblinks to where you can find more information about each artist. Total running time: 1 hour and 39 minutes. Downloaded file is 90.9 MB. Many thanks to Epileptic Gibbon for entrusting us with another guest slot. Please leave a comment if you like what you hear (or even if you don’t… feedback is so important!) or if you want to have your say on anything else connected to this podcast. If you want to keep up to date with news about this podcast, EppyFest, or just chat with other listeners, don’t forget that there’s a Facebook group – just search for the Eppy Gibbon Podcast Show on Facebook and request to join. Eppy will be back for the next episode.